This pH neutral floor cleaner from Misco Products is designed for use in a modern floor maintenance program. 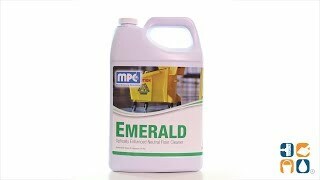 Emerald Optically Enhanced Cleaner contains a slightly acidic pH that will not damage the gloss or film of any floor finish and will effectively neutralize any cleaner residue left behind from previous cleanings. This versatile synthetic pH-neutral floor cleaner can be used for general floor cleaning and heavy-duty floor cleaning, as well as a mopping solution additive. The controlled foam also makes Emerald floor cleaner ideal for use in automatic scrubbers. This effective floor cleaner will dissolve all ice melt and hard water films, leaving behind a thoroughly cleaned floor with no soapy haze, while the optical brighteners enhance the floor’s beauty once it has dried. 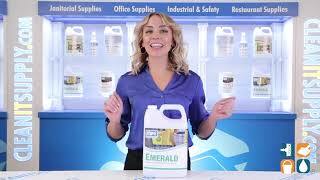 Stock up on Misco Emerald Floor Cleaner today and save! The product is used to eliminate stains and clean floors. I have used Emerald for many years, excellent product!